When you sign up for services — some combination of TV, broadband, and/or phone — from your cable company, you’re told you’ll pay something like $49 or $99 a month… and yet the price you actually pay can be 30-40% or more on top of that, thanks to a heap of sometimes confusing charges and fees. Which ones do you blame the government for, and which are made up by your cable company? One cable company at a time, we’re going to use real customers’ bills to break it down. We’ve already looked at Comcast. Up now: Time Warner Cable. The below bill was provided to Consumerist by a real-life TWC customer who subscribes to a triple-play (TV, broadband, and phone) feature-heavy package for a promised rate of $169.99 per month. The subscriber also pays for some extra sports and programming options, which increase the rate. But even with those premium content add-ons, a whopping $76.60 — around 28% — of their monthly $274.57 bill comes from some kind of surcharge or fee. This particular subscriber explains to Consumerist that they called TWC to change their premium tiers and bundle options some time in the recent past. 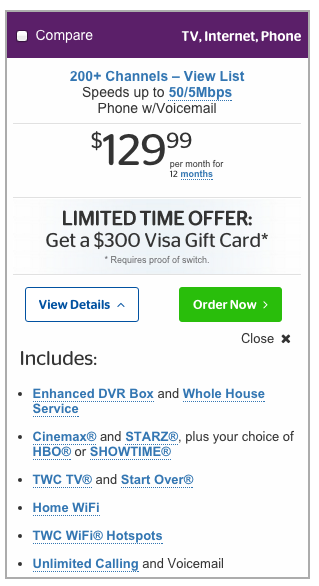 TWC’s solution was to switch the customer to a package that included all of the desired features at a lower rate than if they had been added a la carte, and locked them into a two-year promotional rate of $169.99. This line-item discount of $10.01 is how TWC squares those numbers. This customer is a sports fan and subscribes to the TWC Sports Pass, which provides a lengthy list of channels including ESPN Classics, all the ESPN College Extra stations, Fox Soccer, Fox Sports’ regional networks, the NFL Redzone, the Tennis Channel, and more. This customer subscribes to the Starz package of premium channels for an additional $15.99 per month. This is the fee Time Warner Cable charges for your set-top box. When the FCC says consumers are paying $20 billion a year in box rental fees, these are the kind of fees they mean. Although the bill lists two separate charges called two separate things, this particular consumer says both set-top boxes in their home are identical HD, DVR-enabled units and they are not sure why the two units are coded or billed differently. In some states, this fee is taxable. If you own your own home WiFi router, this charge is $0. If you use a router provided by Time Warner Cable, or use the WiFi router capabilities of a wireless gateway provided by Time Warner Cable, this fee is $4.95 per month. Not pictured: Additional channels, services like “The Guide,” or equipment like digital adapters or CableCARDs would appear in this section, as would individual services for anyone not subscribed to a comprehensive double- or triple-play bundle. Additionally, TWC breaks out credits, returned equipment, partial-month charges, and service appointments into their own headlined sections of the bill, when any of those conditions exist. The law, however, does not require cable providers to pass through the fee. In spite of what the name implies, this fee is not required by any state or federal law. PEG stands for “public, educational, and governmental.” In other words, this is a fee that funds public access channels in this subscriber’s particular area. Where this subscriber lives, TWC’s franchise agreement says that a fee equal to 1% of their gross revenues must go to the city to fund PEG capital expenditures. Telecommunications companies may, but are not required to, pass that charge through to consumers. This is basically the state version of the Regulatory Recovery Fee (#10). This fee is, again, permitted but not mandated by law. TWC collects these funds to recoup its costs of complying with state regulatory requirements (like TTY service for the deaf and hard-of-hearing). This subscriber’s state maintains its own Universal Service Fund, to help provide affordable telecommunications services to low-income or underserved consumers in the state. The FCC’s Universal Service Fund pays for programs like Lifeline that expand phone and Internet coverage to include more rural and/or low-income Americans who would otherwise be unserved. This fee is particular to the jurisdiction where this susbscriber lives. TWC levies it as a pass-through fee to recover expenses associated with state franchise taxes. This fee is a way for TWC to raise prices while pretending not to raise prices. Basically, it’s just a fee on TV services for… being TV services. They introduced the fee in Feb. 2014 and claimed it was to “educate” consumers about rising retransmission fees, which of course cut badly into TWC’s profit margins. How much this fee runs you varies pretty widely by market. While this particular consumer pays $8.75, other TWC customers who shared their bills with us got charged as little as $2.75 or a flat $5. Not pictured: Other state and local pass-through fees charged in different jurisdictions, such as a “public access” fee, “school district” fee, “metropolitan area” fee, or other highly local charge. Also note: In some markets, TWC lumps all fees, surcharges, and taxes together under the single header, “Taxes, fees & surcharges,” instead of separating them. Time Warner Cable bundles all state and local taxes on voice or video telecommunications service into one single line-item. This particular subscriber lives in an area where both their municipality and also their state charge sales tax on telecommunications services. Googling “[state name] communications tax” should be the fastest way to find the pay-TV or voice line service tax rates in your state. Rates may also vary based on the county or city where you live. This fee is imposed and set by the state where this subscriber lives, which also sets the rate. It works like a sales tax: the business making the transaction is responsible for sending the money on through to the state. Several states have some similar kind of fee; finding your state’s regulation or actual language will take a thorough Google search through your state and possibly local tax, communications, or public utility law, depending where you live. The state where this subscriber lives imposes a charge on every phone line — landline and wireless — to contribute to financing the state’s Enhanced 911 services. The vast majority of states impose a similar fee. This is basically an extension of the E911 fee in this particular subscriber’s state; the secondary fund is used to cover 911 services in parts of the state that don’t have enough local funding. Time Warner Cable not your cable/Internet/phone provider? Previous installments of this feature have covered Comcast, and future editions will include detailed bills from Charter, Verizon FiOS, AT&T U-Verse, and others.